Sound Digital, the consortium set up by Arqiva, Bauer Media and UTV to run the second national DAB multiplex (D2) from next year, has been named as the winner of the multiplex licence. Backed by some of the UK's biggest commercial radio organisations, Sound Digital promises to bring stations such as Kisstory to a wider audience, while reintroducing the Virgin Media brand in the UK and launching new services, such as three new stations from TalkSport. Sound Digital was up against Listen2Digital, a rival bid for the multiplex licence backed by Orion Media and Babcock in partnership with Folder Media and Sabras Sound. Listen2Digital had hoped to launch stations including Chris Country, Fun Kids and RTÉ Radio 1 across the country on DAB. Rock and pop. 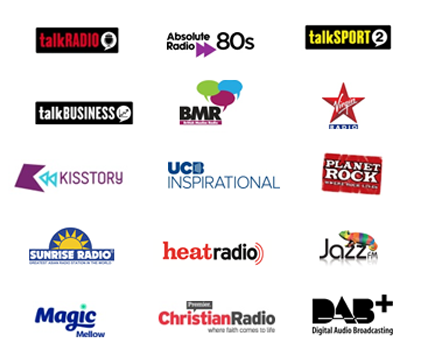 A revival of the Virgin Radio brand in the UK. 'Old Skool' dance tunes. Currently on other DAB multiplexes. Pop, celebrity and gossip. Currently on other DAB multiplexes. Currently on other DAB multiplexes. New national service for DAB. Classic Rock music. Transfer from D1. Sound Digital's multiplex will broadcast from 45 transmitter sites serving 75% of the UK population. All DAB stations will be in mono, but the consortium advises that the uptake of DAB+ may facilitate a switch to stereo in the future. "The award of the second national commercial DAB network to Sound Digital is a defining moment for digital radio and an unprecedented expansion, which will more than double the number of national commercial stations on DAB. Nearly 50% of UK households already have a digital radio, and over 60% of new car registrations have digital radio as standard, so if you don't have digital radio at home or in your car, the time is now." In the past year I've tried three different brands of dab radio in my house and none could get a signal in either the living room or kitchen, the two places where I listen to radio. I had to take the radios outside to get any reception and even then it sounded rubbish. It was fair for listening to voice only transmissions (the news or whatever) but for music was awful. Radio 3 for instance, all the instruments in an orchestra sounded so bland, no colour to the sound at all, very unenjoyable. My thirty quid (and god knows how old) fm radio works in every room and has a sound that is both colourful and vibrant, very different to junk dab. Nearly 50% of UK households already have a digital radio do they? Well I wonder how many like me had to return their radios because they couldn't get a signal indoors? If this is the future for radio you can stick it as far as I'm concerned! Coverage is being boosted across the UK between now and the end of 2016, which will bring the BBC's national DAB network to 97% of the population. That's a long list of stations for one multiplex. They'll sound dire like all other DAB stations with the low bit rates needed for that many. Our DAB reception is perfect as we receive reception from the Bridlington's Buckton Barn transmitter, less than 5 miles away, for BBC National, Digital 1 & Humberside Mux + Yorkshire Coast Radio 102.4 FM. Any national FM signals have to comes either from deepest Lincolnshire or from the top of the Pennines. The new Digital 2 will cover 75% of the population compared to 97% for BBC National and around 90% for Digital 1 plus the government's aim is for Local DAB to reach 90%. So I guess it is all down to where you live. Same old, same old! Hardly inspiring and I wouldn't hold my breath on DAB take up on the back of that line up. If you live in Wales it looks like an English mux for the English people - 46% coverage on complaint plan and 53% on enhanced are they having joke or what? Thank God streaming music and radio at home is evolving much more quickly than DAB take up. This lot will be "Betamax" in a few years time. Personally, I find the decision to award the licence to Sound Digital very disappointing. The Listen2Digital bid seemed to offer something both different and distinctive. Instead, we are being offered many stations which are not new or are slightly reformatted such as Magic Mellow - there is little innovation or imagination in this bid. In terms of listener choice, this was a bad decision. As for sound quality, mono? Seriously? If you want mono, switch to AM. This is 2015, not 1915. Money and commercial considerations win over listener choice and sound quality. It's about time a campaign was started about this with our politicians being held to account - they award the licences and set the standards after all. A bad decision at the end of the day. I missed the line that said all stations would be mono. What a total waste of time! The sad thing is DAB can sound quite good, at 192kbps or higher per station. The original BBC DAB multiplex proved this, before they reduced bit rates to squeeze in more stations. A missed opportunity, we get more capacity and what do we do with it? Broadcast more crap. We could have substantially improved the sound quality of what we already have. I predict that FM will outlive DAB, with FM serving cars and simple requirements and Internet steaming supplemented by Freeview/Freesat serving the rest. The FM spectrum is not much use for selling off, because it propagates too far. It is no use at all for mobile broadband, which is what the government appears to be in a panic about running out of. I think this is perhaps about of an overkill. Diluting the listener pool further with more and more competition. ~15 stations on this new Mux, about 15 on D1, 10 or so from BBC, around 5 on my local Mux. Thats 40 before I think about FM only stations, plus online. What would happen to the space left over by the commercial stations after their transfer to Digital Two?